The Ministry of Hydrocarbons has disrespected the internationally recognized rights of indigenous peoples in its actions towards the Sapara Nation of Ecuador. On August 30, 73 delegates representing Sapara communities held an assembly and democratically voted to reject all oil activities in Sapara territories. Next month, the Ministry of Hydrocarbons will carry out oil exploration in Sapara territory, directly violating the Sapara’s rights to self-determination. The Sapara Nation of Ecuador was declared an Intangible Cultural Heritage of Humanity by UNESCO in 2001. 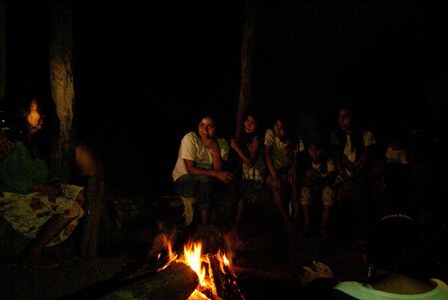 The new oil boom will have a direct impact on Sapara territory, threatening the Sapara’s integrity, life, and culture. The Ministry of Hydrocarbon’s presence in Sapara territory is already causing social divisions. Furthermore, oil exploration violates the Rights of Nature as enshrined in the 2008 Ecuadorian Constitution. We demand respect for our rights as enshrined in our constitution and international treaties. Furthermore, we warn the Secretary of Hydrocarbons that Executive Order 1247, which issues the implementation of free, prior, and informed “consultation” in areas that the government has already decided to convert into oil blocks, is illegal and unconstitutional. Furthermore, the Secretary of Hydrocarbons has not held consultations with the democratically elected Governing Council of the Sapara Nation of Ecuador, therefore disrespecting our nation’s traditional government structures. We state that the Sapara will not be held liable for any damages in our territory as a result of oil exploration. We are obligated to carry out our own ancestral forms of justice and state that the ordinary court systems cannot become involved in our decision making processes, considering that the state has not taken any actions to help resolve the social conflicts in our territories. The announcements for the exploration of block 86 in Sapara territory, as reported by the national government spokesmen, will lead to serious abuses and offenses, and lead to conflicts with amongst Sapara families. Therefore, we are under maximum alert: Sapara territory must not be recognized as individual blocks, we are a single Sapara Nation and single territory. Oil only represents death, social conflicts, and poverty. Development via the extractive industries is a myth. We affirm that oil development in the central south of the Ecuadorian Amazon will not lead to sustainable economic investment in the country. Some studies and indicators even show that the oil reserves in the central south of the Ecuadorian Amazon are low grade and will likely yield low profits. We cannot “bet” on potentially low grade oil reserves and create an environmental travesty of our Naku IKICHAKA—living forest. We would like to tell the national government and the citizens of our country that Ecuador has the greatest biodiversity in the world, in addition to cultural diversity and oral history. The future of humanity is in biodiversity; 80% of medicines come from plants, animals and organisms of tropical forests. By not deforesting the vasts acres of land in the central south of the Ecuadorian Amazon, we can avoid emitting 212 million tons of C02. We declare ourselves in permanent alert. We are children of Aritiawkus, and we have the knowledge of Naku—the forest—which is the abode of the spirits and grandparents who taught us to live in harmony and with respect to nature. Here, we have developed another way of life, one without oil. Categorías: boletin de prensa, Petrolera, territorios, XI Ronda Petrolera | Enlace permanente.